I was having a bit of an existential crisis the other day. You know, the sort where you know you're not getting any younger, and you feel like you haven't accomplished much. The sort where you look back at the dreams you had, and how you fell short. Despondent, I asked Simon what he thought made a successful life. "Enjoying it," he said simply. Therein lies our differences. I have an ego, a hunger for approval, a slightly competitive streak, and yet I've never been able to stay passionate long enough to be exceptional at anything, invariably resulting in a self-flagellating sense of failure. He, on the other hand, is unburdened by the weight of covetous aspirations, and finds it almost bewildering. Sometimes I feel so influenced by the world external to me that I no longer know what it is that I really want. What it is that will really make me happy. I wish, wistfully, for grand accomplishments, but I'm beginning to realise what I really need is to be at peace with myself. sweet and sour... lime and fig compote. So that brings us to this lime and fig compote. Basic techniques. Uncomplicated flavours. Stack it on some freshly toasted bread, and eat it while it's still blissfully warm. Not really a huge achievement, making this. And yet, in that quiet, fleeting moment, I found it unassumingly sublime. The rest didn't matter. Trim off the hard stems of the figs and discard. Slice the figs into eighths. I do this by vertically slicing them into quarters, then horizontally halving the quarters. Simmer the chopped figs with the rest of the ingredients in a saucepan for 15 - 20 minutes until the figs are soft and the juices are reduced. I like to turn up the heat towards the last few minutes, partly to hasten the process, and partly to introduce a lovely thick hint of caramelisation. 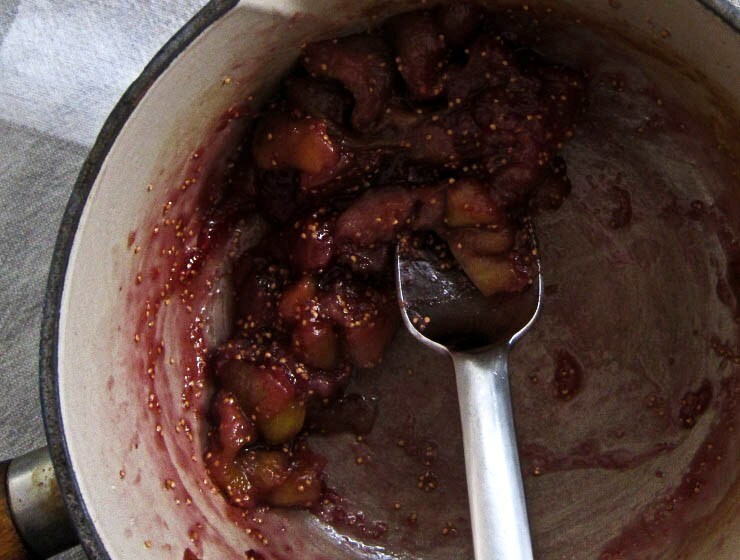 If you're going for a compote that goes with some bread, as I was, aim for a final result that is moist and plump, but free from excess liquids. You want a compote that is dry enough to sit pretty on toast, yet still succulent enough so that the fleshy, almost jelly-like fig pieces burst with juices as you bite into them. So serve this while it's still comfortingly warm, on slices of freshly toasted bread, and congratulate yourself on this little triumph: one of the many you can celebrate amidst the ups and downs of life. 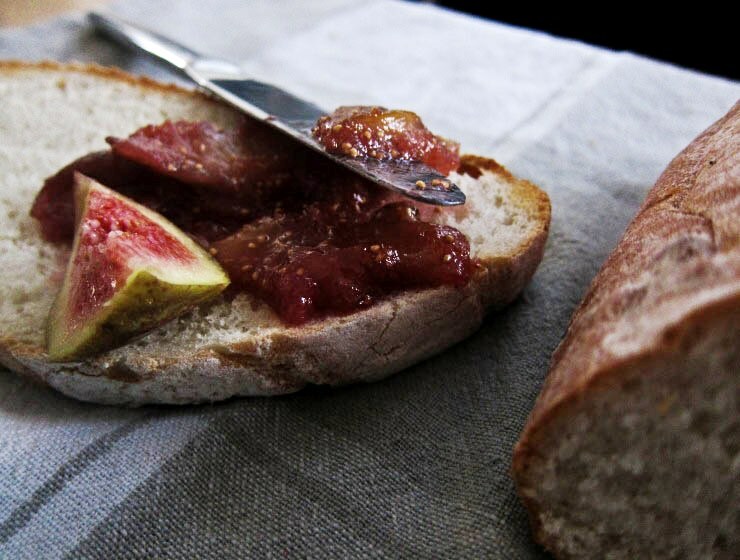 lime and fig compote on toasted pane di casa. Thank you! I'm enjoying the fig season for sure. The great thing about figs is that they can be so tasty with such minimal effort. Some of the best things in life are often the simple things. Trust your instincts. I love this post- I feel like you're describing me better than I ever could! I also have a need for approval and a competitive streak even though I described myself as "not competitive at all" for so long. It really can get me down. Thank you Yumeko! I know what you mean. Sometimes you just have to do what you can and be satisfied (even if grudgingly) with it. I appreciate the simplicity here. Fig is a very gentle fruit and using lime and its zest to lift it up is actually quite ingenious! I love that you have used these figs in such a simple manner. Delightful to say the least. Also thanks for sharing your thoughts with us and I love that simon considers a successful life an enjoyable one - perfect! I strongly suggest reading/youtubing/experiencing Pema Chodron... she is amazing. Oh, it's like you took the thoughts from my brain. So at least you can know that you're not alone out there! Beautiful compote - I love how uncomplicated it is. Being at peace and content with the now is one of my true goals in life. So often, I find myself suffocated with a strange mix of yearning and fear and anxiety and a desperation that I'll never get to where I truly want to be, and yet I can't decide where that is. Terror and yearning. Focusing on simple pleasures and enjoyment, like this compote, is key. Well done, and keep listening to your fella. I think he has the right idea. Yes, definitely relate to that. I feel like there's something that will make me happy, but I'm still searching for that something. Instead of dwelling on that, I should just enjoy what I do, and do what I enjoy. My fella is rather excellent indeed; hopefully his perspective rubs off on me. I can relate to your feeling of inadequacy in wanting to surpass yourself in everything. And I also live with a man who is exceedingly talented in his field (and others) and doesn't seem to bother about those grand aspirations... he simply lives the moment and is doing what he loves. Don't dwell on those so-called failures, because they are anything but! Live in the now and relish in your accomplishments, however small or insignificant they may be for others. If you give them meaning, then it will all turn out okay in the end. Take care Leaf and thank you. Ah leaf ... we are both on the same page in regards to life!! Sadly I am not entirely a fan of either fig or the tartness of lime ... but I completely endorse the sentiment behind the dish! Leaf, you've eloquently expressed how some of us feel often! I feel a drive to push myself and be competitive and seek things too and wish that I often didn't so things could be peacefully happy! The competitiveness and the seeking is both a blessing and a curse, isn't it? But, bless, I'd definitely say you are quite the success, Lorraine! Thank you for your wise words, Sarah! And yes, I think blogging does help me cherish, even more, those little pleasures that really make life what it is. I love figs and your compote looks delicious. Simple and delicious. Gorgeous photos too. This is exquisite! Enjoy just being you.... life is over way to quickly! Thanks Lizzy. You're an inspiration when it comes to a positive outlook on life! Everlasting contentment can be so elusive, no? I think sometimes we're too hard on ourselves. I so could have written this post! but I didnt, you did... Im better these days with the 'whats it all about?' head shag but it still creeps in every now and then. We just have to keep soldiering on and cooking. Indeed. Hopefully these niggling thoughts come around less often with age. Or perhaps we'll find the antidote. I very much sympathise with your feelings but did get distracted by the beautiful recipe. I do have a fig obsession at the moment they are just so delicious! It's hard to ignore a good fig! Distraction is what it's all about. Simon is wise indeed, and as for his thoughtfulness, I think his greatest gift is actually in not thinking too much, but just being and doing. This sounds like a beautiful recipe. I really enjoy the stories behind each of your posts (echoing Winston). I can identify with a lot of these feelings! I love compote and this is just a divine combination... I see what you mean about the citrus love; I'm with you! :). Leaf, A little triumph indeed! I've never pared lime and fig, but now I want to:) Your compote looks awesome. So true! Rather than dwelling on the negative, perhaps it would be a better idea to spur ourselves on with our positive achievements. I totally agree about being at peace with oneself. When I was working like crazy, counting achievements as tangible performance indices, I felt I did not accomplish much. However, after I slowed down and gone back to the basics of enjoying life really simply, I learn to be at peace with myself. Yes, I think slowing down and going back to the basics is a good idea. Nice to hear that it's working out for you! My best friend is like that. She has a great job and a degree at 22 but feels like she's achieved nothing. I often don't know what to say to her sometimes! I so totally understand what you mean! I have the drive to keep me motivated to achieve something, actually, but I can assure you that when I get there it never feels as I was expecting it to. I should definitely enjoy life more. Bring in the figs! Thank you! I've also had achievements before where it doesn't feel as amazing as I thought it would be. Interesting how that happens. Bring on the figs, indeed, either way! So simple, but looks delicious! I'm a big fan of figs as well so this is certainly one I'll be trying. In Existential Crisis person generates negative thoughts about his existence, But there are a few things that when explained can reduce his feeling of emptiness of his life. It is important to make him understand that the situation is not caused due to his thoughts. Besides, everything that he thinks is not real but an illusion, and his idea of the world is how he perceives it, and not what it actually is. Yum! I'll be trying this!! I love the way you write. I'm a big believer in fate, once I realised that things happen for a reason and that the path you travel is somewhat chosen by the universe, I started to relax a whole lot more. Now hand me that Peruvian pipe and a daisy chain.